Camfed treats everyone we work with as an individual. But we do not support anyone in isolation. We believe that successfully supporting an individual means investing in the structures that support her. Training teacher mentors, providing school equipment, and establishing and nurturing parent support groups are just some of the ways we help young people to flourish. Successfully supporting a girl also means investing in all aspects of her life. 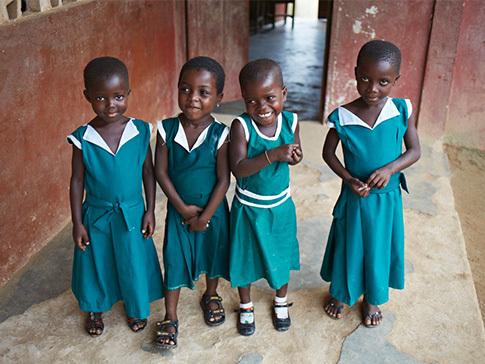 We not only pay school fees, but provide other essentials, such as uniforms, books, and sanitary protection. And we invest beyond the classroom, supporting young graduates with additional training and resources to become economically independent leaders in their communities, helping other vulnerable children to access and complete an education. 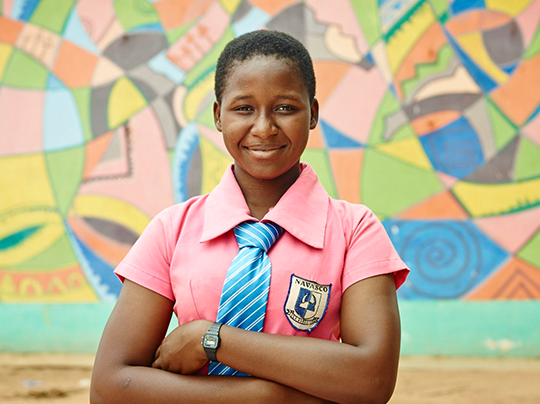 Angeline, one of the first girls supported through school by Camfed, explains how Camfed and communities come together to support girls through school. Camfed focuses on the extraordinary potential that is unlocked through girls’ education – for individuals, for communities and for economies. The right process of supporting girls to go to school massively pushes up the returns of investing in their education. Our model tackles inequality and unlocks the benefits that accrue from girls’ education, igniting a wider social movement in girls’ communities. We catalyze community resources to support vulnerable children, and young educated women become a new constituency of leaders and activists at the forefront of a larger movement. Girls’ education becomes the entry point for widespread systemic change. Camfed’s Model has the girl at its centre, communities as its stakeholders, and operates accountable, transparent programs. Our programs begin with an individual girl in rural Africa. By looking at the world from her perspective, we work to dismantle the barriers to her education and to living a healthy adult life. We’re answerable first and foremost to her. Change can’t happen without community support. We believe people living in rural communities are best placed to solve the problems around them. Community members of all levels help with our program design and implementation. All our systems and processes support the principle of accountability to our clients. We ensure full transparency in our management of financial resources, with communities as our ‘shareholders,’ and run robust auditing systems. At primary level Camfed provides funds to school-based committees to cover essential school-going costs for vulnerable children - both boys and girls - at risk of dropping out of school. We also train and support Parent Support Groups, which volunteer their time and resources to keep poor children in school, by providing nutritious school meals for example. Camfed commits to supporting each girl, selected through a transparent process by her community, through the entire secondary school cycle, providing the support she needs to stay in school, such as school fees, supplies, a uniform, essential personal items, and boarding fees where required. We train Teacher Mentors to look after girls’ psycho-social needs. 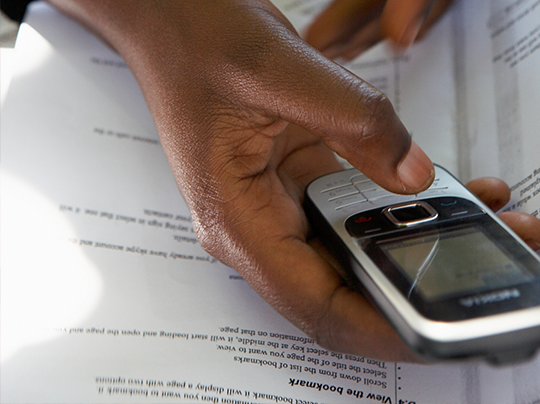 Through the CAMA alumni network, young women graduates access peer support, training and financial resources that open up new pathways to independence, including financial literacy, ICT, health, business and entrepreneurship training. Core trainers pass their knowledge on to other alumni. 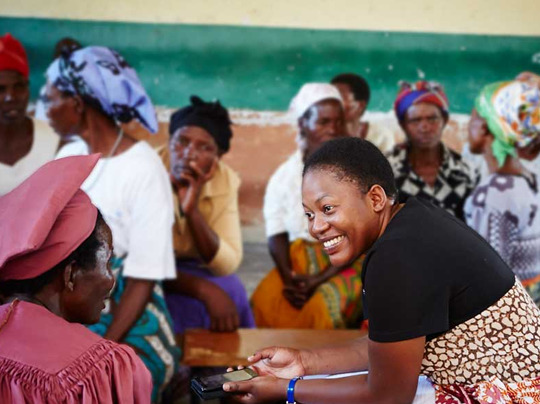 CAMA’s seed money scheme helps young women to set up rural businesses. Alumni support more vulnerable children through school, multiplying the benefits of their education. As role models and mentors they deliver health, wellbeing and financial literacy programs, share sustainable agricultural practices and business skills, and sit on local and elected committees, changing the prospects for marginalized people in their communities. Child protection is a non-negotiable, central tenet of our work. We hold information on every girl who receives support to track her welfare, and we engage with all those who hold authority in relation to girls in order to mitigate girls’ vulnerability to any form of abuse. This is enshrined in our Child Protection Policy which is recognized nationally and internationally as a standard of best practice. At every government partner school, we train Teacher Mentors to look after the psycho-social wellbeing of vulnerable children. We also train School Management Committees in child protection, and partner with communities, civil society organisations, district officials, and other NGOs to step up action to reinforce child protection. At the same time, we work directly with government Ministries to develop child protection guidelines for national rollout.